Whether or not you’re a car buff, exciting things are in store for the automotive market for 2019. Technology continues to expand and add new things each year, so that’s nothing new, but this upcoming year you’ll see completely new concepts as well as redesigned models you thought would stay in the past. If you’re into crossovers and SUVs you’re in for a real treat, as these will see the biggest changes. And if you’re eco-conscious, you’ll be particularly pleased in 2019. Many new hybrids are on their way, from Lexus, Honda, Jaguar, and Porsche. If you’ve been looking to get into the hybrid space but have had reservations about the models offered up until now, get ready to see some options that are more up your alley. Regardless of what your car obsession is, there’s sure to be something fascinating for you in the coming year – it’s certainly an exciting time to be a car buyer! Let’s delve a little deeper into what’s next for the car market in 2019. For 2019, there will be a fair amount of redesigns as well as completely new crossover and SUV models this year. For fans of Acura, a completely redesigned model of their RDX is headed your way. This highly rated luxury SUV has pleased consumers for a while, and Acura hopes this trend will continue – and even increase with this new design. And if you prefer Subaru, you’ll be happy to know that there’s a new 3-row Ascent SUV – especially good news if your family has grown! If you like toting things around in pickup trucks, your options have expanded for this upcoming year. The Ford Ranger, compact but sturdy, is making a comeback after 8 years with a completely new design sure to impress those who have missed it, as well as those who never knew it existed. And if you’re a fan of the Ram 1500, Chevrolet Silverado 1500, or GMS Sierra 1500, be on the lookout for sassy new redesigns sure to shake things up a bit and make them more exciting. It seems that every day sees more hybrids on America’s roads, which is good news overall for the environment. If you’re one of these hybrid owners looking to trade in for a newer model – or you’ve been eyeing a hybrid for your next ride – stay on the lookout for your expanded options for 2019. These sleek new designs include Honda’s Insight sedan, the UX hybrid SUV by Lexus, Jaguar’s I-Pace all-electric sedan, and Porsche’s Mission E. No longer just the realm of cute, small smart cars, the Mission E is the sport sedan’s break into the electric car market. And, of course, you still have the Model X by Tesla, whose success this year will be challenged by Jaguar’s I-Pace – as long as Jaguar’s model sees the success its makers are expecting. And now, with your interest hopefully piqued, let’s take a look at a few specific models to see how they’re changing buyers’ expectations for the new year. Yes, indeed, it’s back. You may have shed a few tears in 2012 upon finding out it wasn’t coming back, but worry no more. Popular demand has brought this truck back, sleeker and better than before. Key frame features to better your drive include a 2.3-liter EcoBoost engine and automatic transmission that’s 10-speed. And if you’re the adventurous type, get ready to rejoice: the updated off-road package includes specialized shocks and suspension, protective skid plates, and a Terrain Management System. These features will keep you safe and alert when you’re off the beaten path. Updated safety features include lane keeping assist, blind spot monitoring, automatic emergency braking, pedestrian detection, and lane departure warning. Whether you’re an experienced driver or looking for a car for a new driver, this car’s safety features will keep you and yours safe on the road. Giving the Ford F-150 a run for its money in 2019, this newly updated Silverado comes with 6 engine choices (including an inline-six turbodeisel option), up to 63 feet of cargo space, a truck bed built of higher strength steel than before, and a lighter weight. Yes, ladies and gentlemen, this model weighs a full 450 pounds less than its predecessor. But don’t fret, as it’s heavy-duty nature can still tote your heavy cargo around. Less weight just means less bulk to maneuver around! Key entertainment features for this model will include Android Auto, Apple CarPlay, wireless phone charging, and a 4G LTE Wi-Fi hot spot. What more could you need? Intended to offer competition to the Tesla Model X, this all-electric SUV’s design resembles the Jaguar F-Pace, but without all that gas guzzling. This car will cost you around $70,000, and will take you around 240 miles before you have to recharge it. Just remember to keep your letters straight – the F-Pace or E-Pace aren’t what you’re looking for this year, but the I-Pace. Whether your family has expanded or you just like the extra room, this addition to Subaru’s SUV game is sure to make your day. This 3-row SUV game is Subaru’s attempt to succeed with midsize SUVs after the Tribeca fiasco back in 2014. 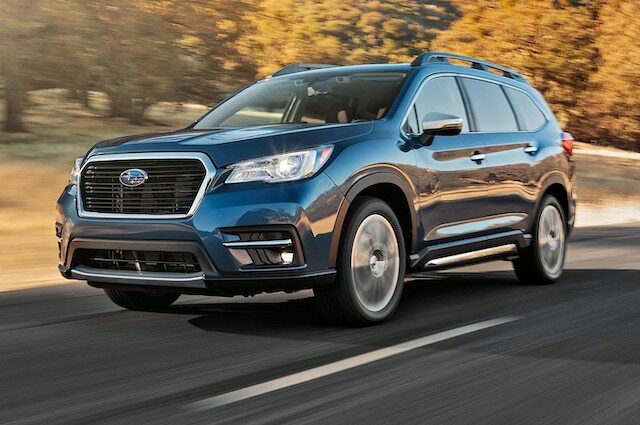 The Ascent offers standard Subaru features such as a 5,000-pound towing capability, 260-horsepower turbocharged 4-cylinder Boxer engine, and all-wheel drive. For your comfort, Subaru has you covered with its tri-zone automatic climate control, Apple CarPlay, Android Auto, and a 6.5-inch multimedia system. And that’s not all – you’ll also have a Wi-Fi hot spot, an 8-inch multimedia screen, rear cross traffic alert, blind spot monitoring, and lane change assist. Not only that, but Subaru’s EyeSight driver technology is there to keep you and yours safe. If you’re a big supporter of the environment but haven’t been a big fan of the hybrid designs up until now, then Porsche has saved the day with their 2019 Mission E. This car was built with the same technology as the Porsche 919 Hybrid, which is pretty impressive. The Mission E is the first all-electric vehicle from Porsche, and gives you a combined output of over 600 horsepower. Translated into simpler terms, this means you can go from 0 to 60 mph in less than 3.5 seconds. Fans of driving fast, rejoice! But this car doesn’t just look impressive, it also has technology to keep you safe. Its eye-tracking technology keeps track of where you’re looking on the infotainment screen and combination gauge, and it allows the digital instrument panels to move with you as you drive. Look for this car by the end of 2019, and save up between now and then – its price point will start at around $85,000. One of the best luxury SUVs according to many rankings, the 2019 version is adding some improvements to make your driving experience that much better. Sharper lines, a lighter curb weight, and a brand-spankin’-new infotainment system (the Acura True Touchpad Interface) are sure to impress you when you take this car out for a test drive. This RDX will feature a 10-speed automatic transmission and 2.0-liter turbocharged engine, which paired with an all-wheel drive system will up the car’s torque by 150 percent. As far as entertainment goes, the 10.2-inch HD display will now be in your eyeline. It’s no longer a touch-screen display, but instead you have a touchpad you can use. If you’ve been a fan of the QX50 – which, as you know, replaced the EX in 2014 – then you’ll be interested to hear of the car’s redesign in 2019. The new aesthetic design includes curving lines along each side and aggressive headlights that will help you see even better on those late-night and early-morning drives.